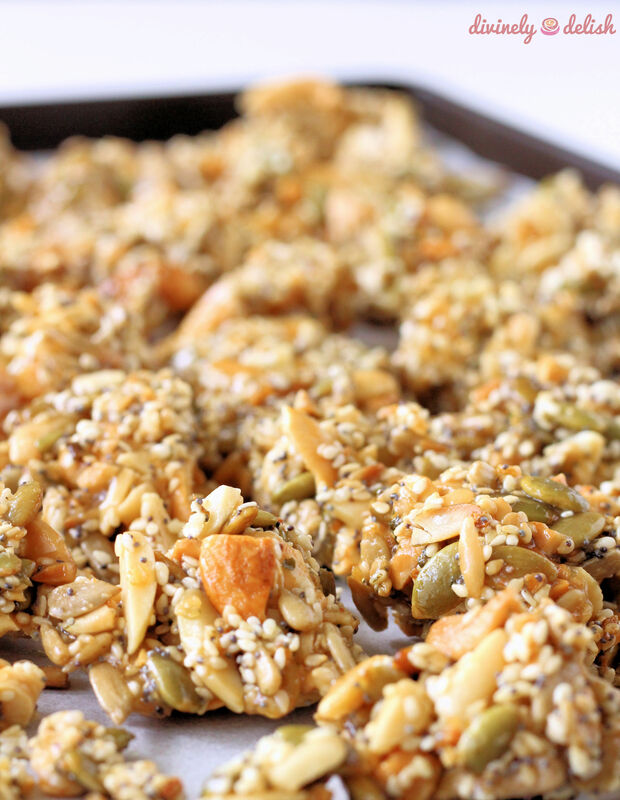 I first tried savoury seed and nut clusters from Whole Foods and totally fell in love with them. I tend to prefer savoury snacks, so these were right up my alley. After the first few bites, I was already thinking how easy these would be to make at home and, not to mention, much cheaper too! 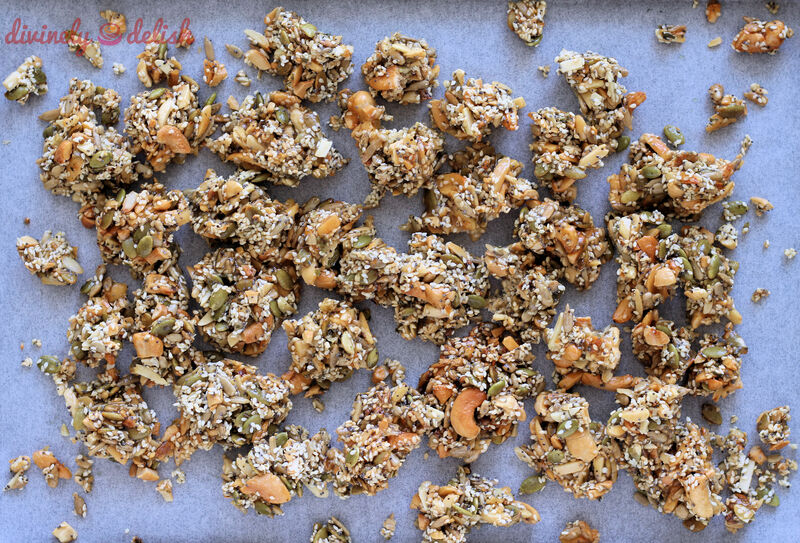 What I like about these clusters is that you can play around with the ingredients and add in whatever seeds and nuts you have, and any spices and flavourings. As you can see from the picture below, I added in poppy seeds this time, although it’s not something I usually add (just a personal preference – I used poppy seeds the very first time I made clusters, but thought they’d taste better without). I was out of flax seeds, so I decided to use up the remainder of my poppy seeds. The first time I made these, I used honey. However, I later switched to maltose, a much less sweet alternative, and one that also doesn’t contain fructose, which is something I try to avoid consuming too much of. You can also use brown rice syrup, which is made up of 50% maltose and also less sweet than honey. I flavoured the clusters with some tzatziki mix that I’d bought in Greece (not that I purchased it for this purpose, but it was just what I had!) and it turned out tasting great! If you can’t find tzatziki mix, you can also onion dip mix, garlic powder or garlic salt…really, whatever you have! Just remember to adjust the amount of salt that you add, depending on the type of sweetener and spices used. 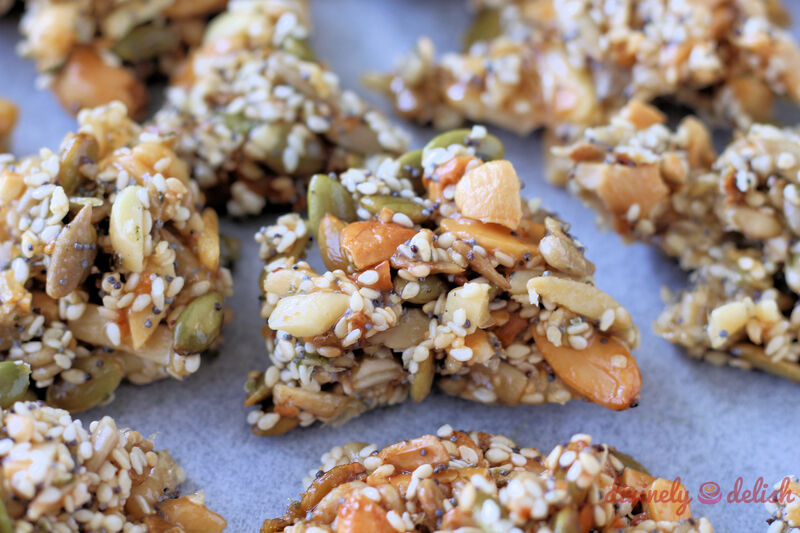 If you’re looking for healthier snacking options, you’ve got to give these a try. They’re even great for breakfast on the go. 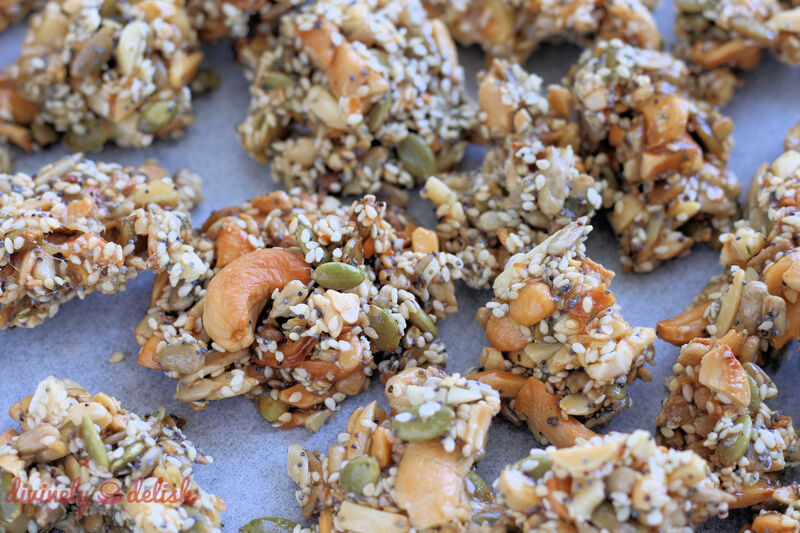 I can’t tell you how many times I’ve made these clusters in the last couple of months. They’re seriously that good. Plus, they’re super easy to make! 1. Preheat oven to 325F. Line baking sheet with parchment paper. 2. In a large pot, heat the coconut oil and maltose over medium heat. Add in salt, pepper and tzatziki mix. Stir to combine. Heat until mixture just starts to simmer. Remove from heat. 3. 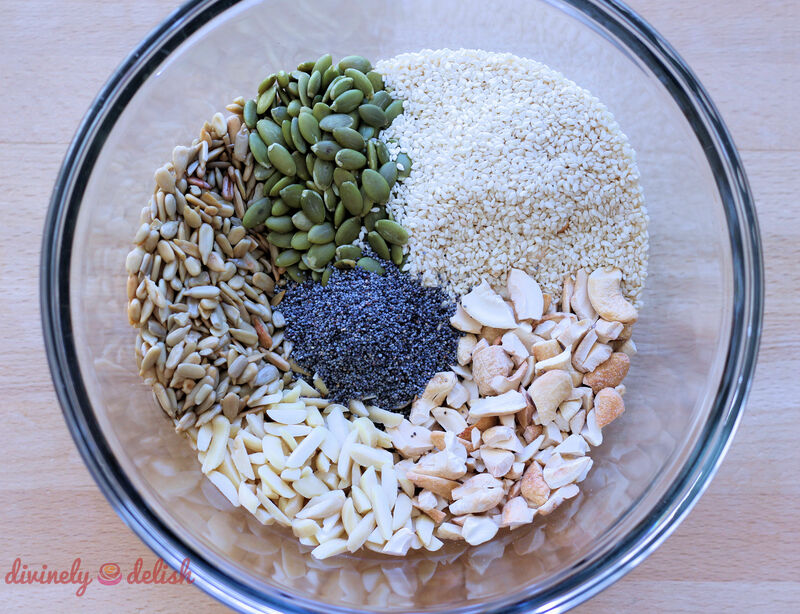 Add in all the nuts and seeds. Mix well to combine. 4. Pour nut mixture onto baking sheet. Using a spatula or back of a spoon, flatten and spread out the mixture a bit (you don’t want to spread it out over the whole baking sheet). 5. Place in the oven for a total of 15 minutes. Halfway through, take it out from the oven and mix it (this prevents the edges from getting too brown) and spread it out again before returning it to the oven for the remainder of the cooking time. 6. Remove from the oven and cool for 5 minutes. Transfer to a wire rack lined with paper towels to soak up any excess oil. After about an hour, it should be cool and firm enough. Break into “clusters” of different sizes. Store in an airtight container. Love this post, thanks for sharing the recipe! That’s so true- these nut clusters are super expensive! You’re welcome! Glad you like this!